Tougher than Tuff! King of Kong! Zanier than Zogo! Wait...zanier? What we mean is that this pet toy is the toughest of the tough in fetch toys. While no dog toy is truly indestructible (and be very wary of those that claim their toys are), this is the closest we've found. Made from multiple military grade ballistic materials, our Bunker Dog Toy is built to last. This fetch toy is meant to be used for just that, fetch and fun. While it will survive chewing sessions it is absolutely not recommended as a "set it and forget" chew toy. Your dog should be supervised at all times while playing with this or any other toy for that matter. 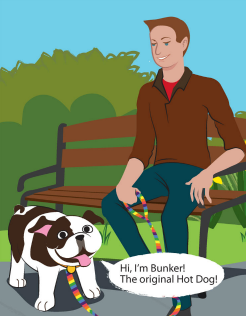 Our Hot Dog Bunker Toy is different than the rest because it is made from real military grade materials, floats, is easy to clean, has survived all but the top 1% of tough chewers, and best of all, are made right here in the USA! MADE IN THE USA - There are plenty of cheap dog toys available, but (at the time this was written) we are the only one using military grade ballistic materials from here in the USA. Real US employees, real US jobs, and a real family owned business! Finn LOVES this toy as do I!!! he loves the leather side and as a 1year old lab its still in one piece! HotDog!!! The best toy EVER! So hard wearing, dog loves it. Great for throw and fetch as well as general chewing. Perfect for large dogs who love to chew and play games.